Stomach ulcers are common in sport horses. An Australian study has compared the performance of aloe vera gel to the drug omeprazole in treating them. Aloe vera is no match for omeprazole in treating stomach ulcers in horses, the findings of an Australia study suggest, although it did result in some improvement among more than half the horses receiving the plant-based gel. Stomach ulcers are common in horses, especially among those used for sport. Researchers from the School of Animal and Veterinary Sciences at Australia’s University of Adelaide wanted to compare the performance of the inner leaf gel of aloe vera plants to that of omeprazole, a drug commonly used to treat gastric ulcers in horses. Sam Franklin, Jordan Bush and Robin van den Boom noted that aloe vera was used by some owners to treat stomach ulcers in horses, although no studies had investigated its effectiveness. The trio used 40 horses from the University of Adelaide teaching herd and client-owned horses which, based on gastroscopic examinations, had been diagnosed with ulcers in either the squamous mucosa or the glandular mucosa. Some had ulcers in both regions. Gastroscopic examinations were performed on all horses in the study. The squamous mucosa is one of two distinct stomach regions. It comprises the upper third and has no glands to produce acid or mucus. The lower two-thirds − the glandular mucosa − contains glands that secrete hydrochloric acid and mucus, the latter to protect the stomach wall. Acid is produced in the stomach of horses regardless of whether feed is present. The horses were divided into two groups, one of which received the aloe vera gel twice a day at a rate of 17.6 milligrams per kilogram of bodyweight. The other group received omeprazole once a day at a rate of 4 milligrams per kilogram of bodyweight. Each course of treatment lasted about 28 days, after which the horses were checked for ulcers with a repeat gastroscopic exam. Any horses with persistent ulcers were offered a further 28 days of treatment with omeprazole and were then examined again. Thirty-nine horses completed the trial. Ulcers in the squamous mucosa – that’s the upper region – had originally been diagnosed in 38 of the horses. Of those on aloe vera, 17% had healed completely and a total of 56% were assessed as showing some improvement. For those on omeprazole, 75% had healed completely and 85% were assessed as showing improvement. The researchers, whose findings have been published online in the Equine Veterinary Journal, found that healing was less likely to occur in horses with prolonged gastric emptying. Ulcers in the lower glandular tissue were less common among the horses, with 14 being diagnosed at the start of the trial. The numbers, they said, were too small to perform any meaningful analyses to be able to comment on aloe vera’s effectiveness in treating these ulcers. In all, 22 horses – 16 from the aloe vera group and 6 from the omeprazole group – received omeprazole for another 28 days. 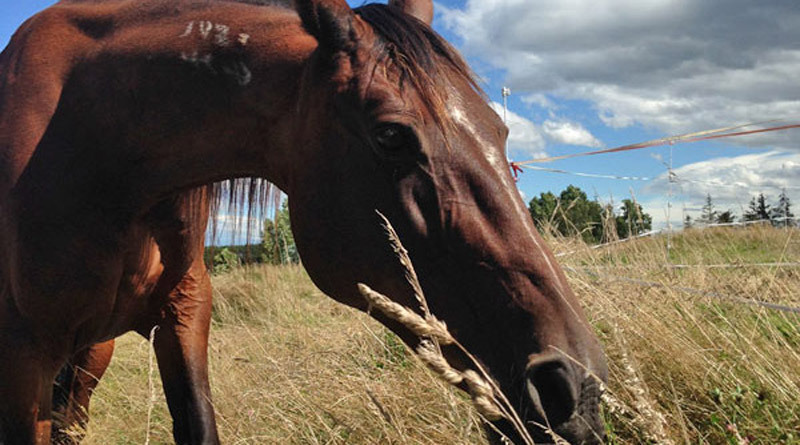 Twenty-one returned for a second follow-up, revealing that the squamous ulcers had healed in seven of the 19 animals, and the lower glandular lesions were healed in five of seven horses affected by this condition. The researchers said that while the findings showed that aloe vera at the stated dose – determined based on an omeprazole study in rats – proved inferior to the drug, there had nevertheless been some improvement in 56% of the horses after 28 days on the plant gel. They said they could not rule out the possibility that a higher dose would have resulted in higher rates of improvement, although the study dose was higher than that commonly given to horses and above that recommended by the gel manufacturer. No placebo or untreated control group was used as it could be considered unethical and would likely have made owners reluctant to enrol their horses in the study, they said. The study was funded by the American Holistic Veterinary Medicine Association.